Join Key West’s most fearsome pirate, ‘His Ugliness’ Admiral Finbar and his scurvy crew aboard his own pirate ship, the gaff rigged topsail schooner WOLF for adventure on the High Seas! Take a step back in time and experience the adventure & swashbuckling excitement aboard the Flagship of the Conch Republic. Each day throughout the Pirates in Paradise Festival, WOLF will be offering afternoon and sunset cruises that promise to nurture the ‘inner pirate’ in kids of all ages! The WOLF will also be offering several specialty sails including a CRN SHOOT & SAIL (11/26) and LITERATURE & THE SEA SUNSET SAIL (11/29.) For more info, please call 305.296.9694 or email Info@PiratesInParadise.com. Throughout the rest of the year, the WOLF is available for private charters and nautical excursions of all types. The ship can travel throughout the Bahamas, Caribbean and East Coast and Gulf Coast of the US. 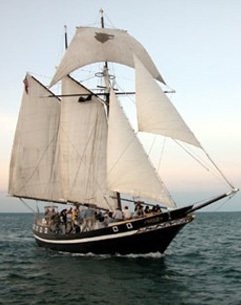 The WOLF is currently finalizing plans for her 2012 East Coast Ambassador Voyage, which will include stops in Savannah, GA, Charleston, SC, Hampton, VA, Annapolis, MD, Boston, MA, New London, CT and New York City. We invite one and all to join us in this tall ship extravaganza that will commemorate the Bicentennial of the War of 1812. A classic 74’ topsail schooner, the WOLF was built in 1983 in Panama City, Florida by Master Builder Willis Rayand Capt. Finbar. 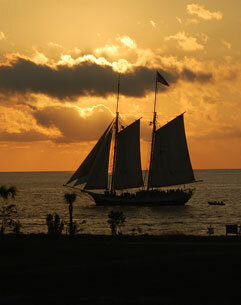 Designed by Merit Walter, the WOLF is a classic steel hull schooner. U.S.C.G. certified for 41 passengers for day sails, 20 passengers coast-wise and six passengers for international voyages, the WOLF has a cargo capacity of 20 tons. The Topsail Schooner WOLF plays center stage for this colorful, swashbuckling Festival, featuring Adventures on the High Seas. Awash with Historic Re-Enactors bedecked in colorful Pirate garb hanging from the yardarms, the WOLF will attack unsuspecting vessels in Key West Harbor. Home ported at Safe Harbour Marina in Stock Island/Key West, the WOLF vessel is owned and operated by Key West Packet Lines, Inc. Designated the Flagship of the Conch Republic and the Florida Keys, the WOLF is patterned after the blockade runners that plied the waters of the Florida Straits, Caribbean Sea and Atlantic Ocean in the 19th century. A Key West icon, the WOLF has been featured in numerous publications, films and documentaries. 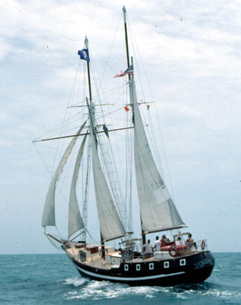 The WOLF is known for her humanitarian Mission of Mercy Sails and has taken donated relief supplies to Port Antonio, Jamaica after Hurricane Gilbert (1987), Guanaja, Honduras after Hurricane Mitch (1998), Hope Town, Abaco Bahamas after Hurricane Floyd (2004) and to West End, Grand Bahama after Hurricane Ivan (2005.) In 1998, the WOLF transported members of the Interfaith Pilgrimage of the Middle Passage to Cuba on their journey of retracing that ancient route of slavery. In February 2010, the WOLF traveled to earthquake ravaged Haiti, carrying donated relief supplies. The WOLF attends numerous seaport festivals and special events, and has participated in OpSail Miami 2000; Cayman Islands’ Pirates Week Festival 2000; Tampa’s 2001 Gasparilla Festival; Americas’ Sail 2002 (Port Antonio, Ochos Rios and Montego Bay, Jamaica and St. Petersburg, Florida); Sail Mobile Tri-centennial Celebration 2002; Cayman Islands Quin-centennial 2003; the 2005 Lee Island Pirates Festival in Fort Myers, Florida; Americas’ Sail 2006 in Beaufort, North Carolina and Green Turtle Cay, Abacos Bahamas 2006 & 2007 Island Roots Heritage Festival. The WOLF is always available for private charters, nautical excursions and extended voyages. During Pirates in Paradise Maritime Heritage & Music Festival, the WOLF will be offering daily passenger sails. Thanksgiving weekend (November 22-25 departing from her homeport at Safe Harbour Marina in downtown Stock Island. On Wednesday, November 28, the WOLF moves to the Festival’s Pirate Village at Truman Waterfront and will be offering daily afternoon (1:30-3pm) and sunset (4:30-6pm) Pirate Sails and Attacks. To book passage, please contact SailAway@SchoonerWOLF.com or call 305-296-9694.